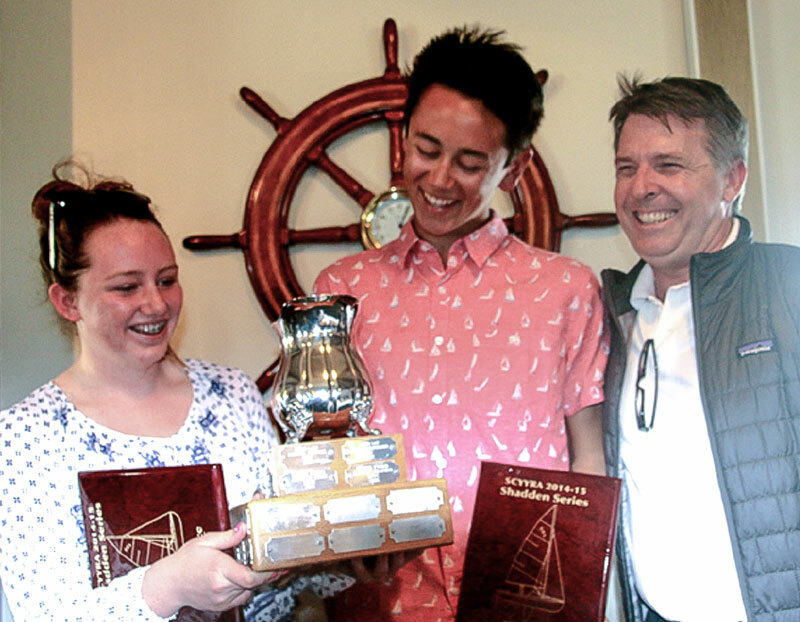 LONG BEACH —They had never sailed together until six months ago when they stepped onto a boat that neither had cruised, but skipper Joseph Hou, 15, and crew Skylar Jacobsen, 14, squeezed out a remarkable victory Sunday, March 1, in the Southern California Youth Yacht Racing Association’s Shadden Series. The competition headlined the Southern California Yachting Association’s two-day annual E.E. Manning Regatta hosted by Alamitos Bay Yacht Club in restless weekend weather through under a remarkable variety of clouds covering Southern California. With a 7-point lead going into the last of four events, they sailed their 13-foot CFJ dinghy to a cautious sixth place among 29 boats to hold off their Newport Harbor YC teammates Patrick Shannon and Grace Vandervort by a single point in the overall scoring of the series, 55-56. The Shadden Series is for teenagers not yet in college and was also a move-up regatta under the advancement guidelines of the International Naples Sabot Association. The Shadden sailors sailed CFJs on an outside ocean course only partially inside the breakwater of Long Beach Harbor, what with a prevailing brisk southeast breeze coming from the open ocean. Lasers joined the CFJs outside, while Naples Sabots and Lido 14s raced inside on the bay. Shannon and Vandervort won three of the seven two-lap windward-leeward races, including the last one, while Hou and Jacobsen won only one. But their sixth in the final race was just enough to collect the prize. They gave credit to their Newport Harbor YC coach, Nate Dunham, who could claim a close 1-2 finish to the series. Rodion Mazin, of Alamitos Bay YC and the U.S. Coast Guard, won all seven Laser races. The Shadden Series is named for John Shadden, one of Long Beach’s premier sailors whose youth career peaked with an Olympic bronze medal performance at South Korea in 1988, with Charlie McKee as crew. The Manning, first contested in 1935, is raced annually at Alamitos Bay YC. E.E. Manning, a member of the Los Angeles YC, was devoted to youth sailing and was an active sponsor and promoter of dinghy racing. The driving purpose of the regatta is to promote youth sailing as part of the Southern California Youth Yacht Racing Association program. The namesake Manning Trophy is awarded to the winner of the class with the most competitors.